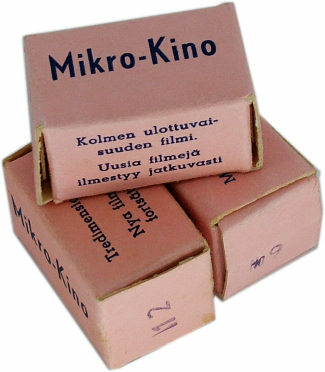 The Mikro-Kino viewer was manufactured in Finland sometime between 1950 and 1960 in Helsinki, Finland by a company calling itself Mikro-Kino Kommandiittiyhtiö . It was an almost exact copy of the American Tru-Vue viewer from the 1930's. The actual viewer had no markings on it whatsoever. The face of the viewer had a white metal plate in crackle finish, held in place by five brass screws. The rest of the body was made from hard plastic.